The MOPITT (Measurements Of Pollution In The Troposphere) instrument on the NASA Terra Satellite makes measurements of infrared radiation originating from the surface of the planet and isolates the energy being radiated from carbon monoxide (CO). By using appropriate data analysis techniques, concentration profiles of CO (Level-2 (L2) data) can be obtained on a global basis at a reasonably high horizontal (~22km) and vertical resolution (~3km). The MOPITT Level-3 (L3) data products provided in this data set are a subset of the daily averages from the L2 data. This subset was produced by overlaying a global 1x1-degree grid onto the L2 data, and then clipping the data to this southern Africa subset which originates at 5 degrees longitude and -35 degrees latitude and extends to 60 degrees longitude and 35 degrees latitude. Data are reported for 2 heights, 700 and 350 hPa, from daytime swaths for the period August 1-September 30, 2000, the SAFARI 2000 Dry Season Campaign. Figure 1. 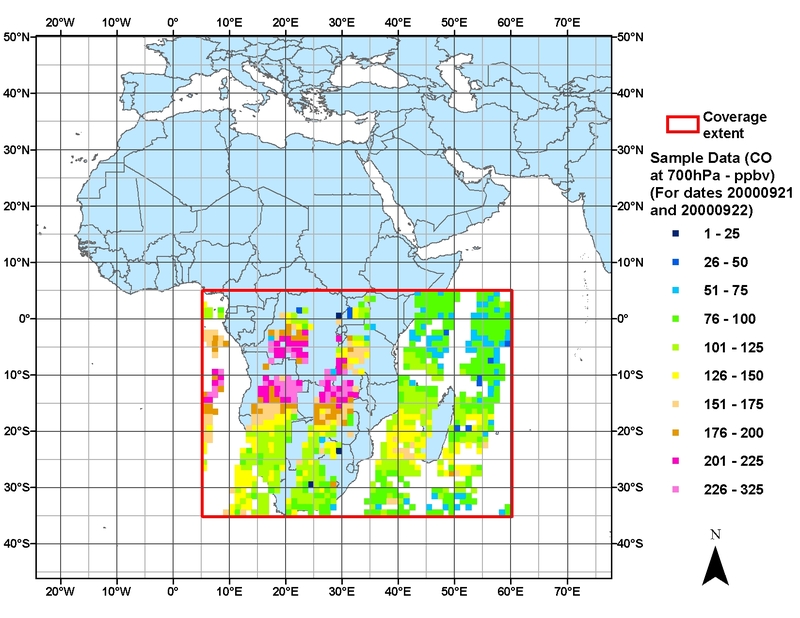 Spatial extent of the SAFARI 2000 MOPITT Tropospheric Carbon Monoxide, Southern Africa, Dry Season 2000 data showing daily average CO concentration at 700 hPa level in ppbv on a 1x1-degree grid for daytime swaths on September 21 and 22, 2000. The L3 data are provided as 1x1-degree daily files in a documented ASCII format for the selected spatial and temporal ranges. See the Data Characteristics section. The MOPITT web site [ http://www.acd.ucar.edu/mopitt/ ] provides a complete description of data collection, processing, and analysis steps for the Level 2 data and the derivation of the Level 3 product provided in this data set. Edwards, D. P., J. C. Gille, M. N. Deeter, D. Mao, and J. R. Drummond 2006. SAFARI 2000 MOPITT Tropospheric Carbon Monoxide, Southern Africa, Dry Season 2000. Data set. Available on-line [http://daac.ornl.gov/] from Oak Ridge National Laboratory Distributed Active Archive Center, Oak Ridge, Tennessee, U.S.A. doi:10.3334/ORNLDAAC/835. * Measure and model carbon monoxide and methane concentrations in the troposphere. * Obtain carbon monoxide profiles with a resolution of 22 km horizontally and 3 km vertically, with an accuracy of 10 percent. * Generate global maps of carbon monoxide and methane distribution, and provide increased knowledge of tropospheric chemistry. MOPITT divides the globe into approximately 1,000,000 individual cells, or pixels, and makes a measurement over each one every four days. Each pixel is about 22 kilometers square, small enough so that emissions from individual cities can be measured. MOPITT makes measurements of infrared radiation originating from the surface of the planet and isolates the energy being radiated from CO molecules by using a technique called gas correlation spectroscopy. Because it measures infrared radiation, MOPITT is able to collect data during the night as well as throughout the day. However, MOPITT cannot see through clouds a limitation that causes a gap in data for cloud covered areas. Models are used to estimate values where there are data gaps due to cloud cover. Funding for the MOPITT instrument is provided by the Space Science Division of the Canadian Space Agency. Funding for the U.S. effort including the development of science data processing software and science data products is provided by the NASA Goddard Space Flight Center. The MOPITT Level-3 (L3) data products provided in this data set are a subset of the daily averages from the L2 data. This subset was produced by overlaying a global 1x1-degree grid onto the L2 data, and then clipping the data to this southern Africa subset which originates at 5 degrees longitude and -35 degrees latitude and extends to 60 degrees longitude and 35 degrees latitude. Data are reported for 2 heights, 700 and 350 hPa, from daytime swaths for the period August 1-September 30, 2000. These are Version 3 data, which are validated, indicating the retrievals have been rigorously compared to independent observations. Errors are quantifiable and constrained. The data are useful for exploratory and process science studies. Users are expected to review product quality summaries before publication of results. Data File Format: A description of the data file format is provided in the companion document http://daac.ornl.gov/daacdata/safari2k/remote_sensing/MOPITT_co/comp/S2K_MOPITT_Data_File_Format.pdf. The relative contributions of CO at each different level to the reported CO mixing ratio at the 700 hPa pressure level for daytime swaths. The relative contributions of CO at each different level to the reported CO mixing ratio at the 350 hPa pressure level for daytime swaths. Figure 2. Spatial distribution of daytime swaths on September 21 and 22, 2000 for 1x1-degree grid values for the daily average CO concentration at 700 hPa level for the southern Africa subset. The data set covers the period 2000/08/01 to 2000/09/30. The goal of the MOPITT experiment is to enhance our knowledge of the lower atmosphere system and particularly how it interacts with the surface/ocean/biomass systems. The particular focus is the distribution, transport, sources and sinks of carbon monoxide and methane in the troposphere. The project has three elements to it: hardware, data analysis and modeling. The MOPITT instrument, on the NASA EOS Terra satellite, measures the upwelling infrared radiance. Using the technique of correlation spectroscopy [ http://www.acd.ucar.edu/mopitt/concepts.shtml ], information regarding the distribution of atmospheric CO and CH 4 can be extracted. By using appropriate data analysis techniques, concentration profiles of CO are obtained on a global basis at a reasonably high horizontal (~22km) and vertical resolution (~3km). Column amounts of methane are derived over the sunlit side of the orbit. These profiles are assimilated into models to study the chemistry and dynamics of CO, CH4 and other constituents of the lower atmosphere. The measurement of CO profiles is of primary importance in an effort to improve our understanding of the global system. Although CH4 also plays an important role in background atmospheric chemistry, knowledge of the column distribution taken with dynamic data may lead to a better quantitative understanding of its biogeochemical cycles. Methane is increasing in the atmosphere at a rate of about 1%/year but the source of this increase is not certain. Improved knowledge of the source strengths and distributions will help to resolve this uncertainty. The problem of understanding tropospheric chemistry is a very difficult one and requires many interacting disciplines to resolve it. [ http://daac.ornl.gov/daacdata/safari2k/remote_sensing/MOPITT_co/comp/avg_krnls_app.pdf ] for the details on calculating and using averaging kernels. 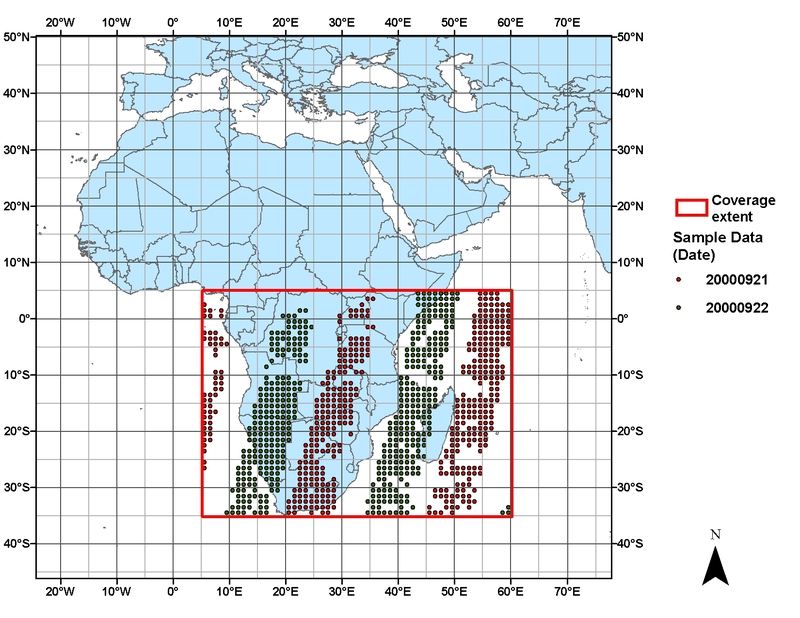 data product, provided in this data set, is averaged from the L2 processed data files onto a global 1x1 degree grid. Carbon monoxide (CO) mixing ratio profiles are retrieved on the 6 standard MOPITT pressure levels: 850, 700, 500, 350, 250, 150 hPa, and at the surface, for global clear sky measurements. anonymous HTTP site or on various media including, CD-ROMs, 8-MM tapes, or diskettes. Bremer, Holger, Jayanta Kar, James R. Drummond, Florian Nichitu, Jiansheng Zou, Jane Liu, John C. Gille, Merritt N. Deeter, Gene Francis, Daniel Ziskin, and Juying Warner. Spatial and temporal variation of MOPITT CO in Africa and South America: A comparison with SHADOZ ozone and MODIS aerosol, J. Geophys. Res., 109, D12304, doi:10.1029/2003JD004234, 2004. Emmons, L.K., et al., Validation of Measurements of Pollution in the Troposphere (MOPITT) CO retrievals with aircraft in situ profiles, J. Geophys. Res., 109(D3), D03309, 10.1029/2003JD004101, 14 February 2004.